If you’re a regular GeekTech reader, chances are you’re a Lego fan, so I hope you appreciate this awesome LEGO Mindstorm clock as much I do. 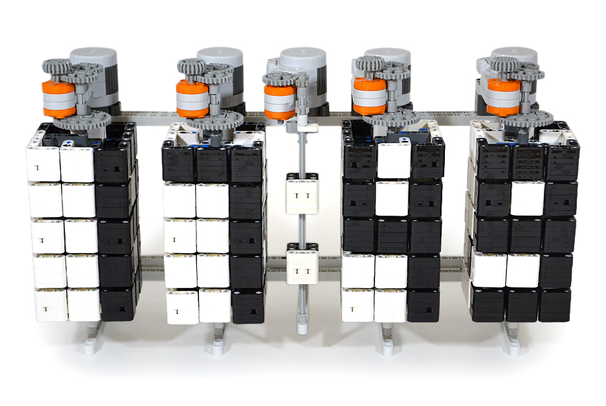 The clock was built by Hans Andersson and uses two separate Lego Mindstorms sets, the controllers of which are slyly hidden behind the two inner numbers, and a few extra Technic pieces. Each number has five layers and each layer is controlled by the one above it so it starts from the bottom and builds the number from the ground up. Hans seems to have some Web development chops, too: His site has an impressive landing page with a picture of the clock that tells the current time. The site also features some other Lego technic projects, including a Sudoku puzzle-solving robot, which I found to be particularly intriguing. I especially like how the bot writes out the digits; I feel like it would make a cool font if it could write all the letters of the alphabet. Hell, if it could do that, it could write your snail mail for you too, if anybody still wrote letters that is. Unfortunately, the instructions aren’t available for the clock right now, but Hans may make them public after several requests. I really hope he does since I want to be able to make one myself. However, the noise it makes is a little too much for a bedside clock, but I’m sure there’s a possible fix to that with a little creativity. And is it just me, or does the “ticking” sound remind you of that sneezing baby panda?